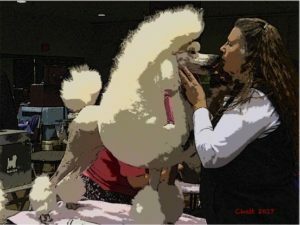 Samson was a “Great Horse” or a large draft horse – a dappled Percheron. It is a very small 5″X 7″ colored pencil portrait on Bristol paper. 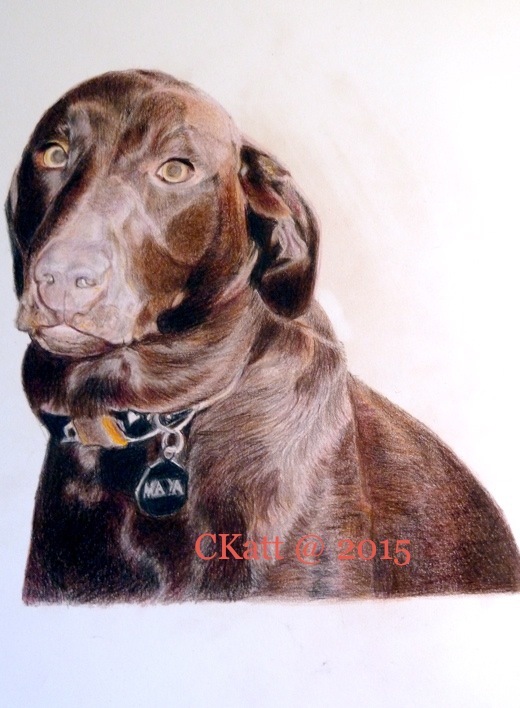 Bristol Paper has a smooth surface that makes getting the details of Samson’s dappled color much easier. I first met Samson when a friend and I took her daughter out to Windy Ridge Riding Stables to inquire about lessons. He was on of the few horses in the large coral area. He sauntered up to us like a friendly inspector as we were trying to get through a gate. He was enormous! My friend said, “Catherine, what do I do?” as she had her daughter in her arms. “Be calm. He won’t hurt you.” Draft horses are generally pretty gentle with kids. And as time proved in many later encounters, that he was a big gentle guy. 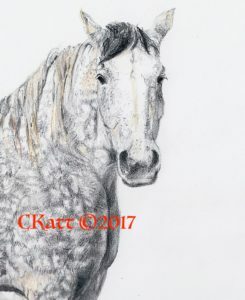 This portrait was purchased by Mark Ward, the owner of the horse riding stable where I took riding lessons. He had Samson from a “baby”. 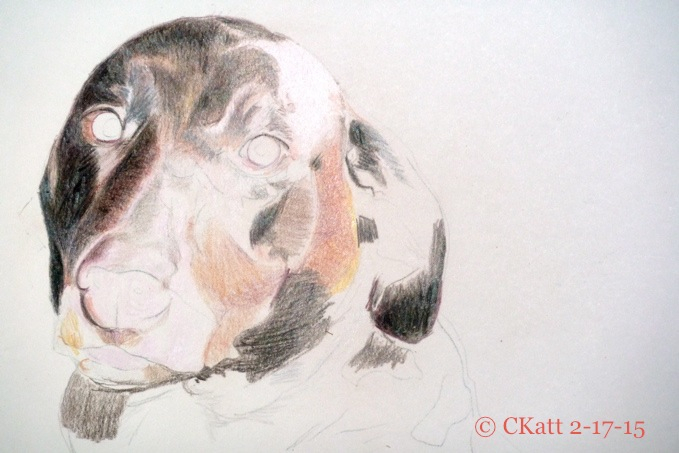 Sadly Samson passed away not long after I made this portrait. This was portrait was completed a long time ago. It’s an oil painting on gessoed wood panel. 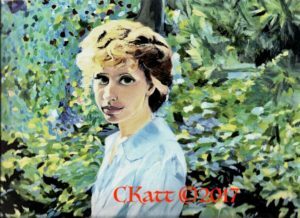 I took photos of Rebecca and chose this one pose for the final painting set in her parents garden in Mill Valley California. Painting on gessoed wood gives a smoother surface than canvas. Sometimes I prefer this smooth surface for better control over the paint. I am drawn to the contrast of light and dark contrasts in my work of sunlight and rich background painting. 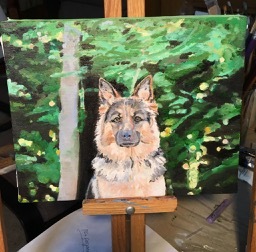 This dog portrait was done as a birthday present for a friend’s brother from their original photo. 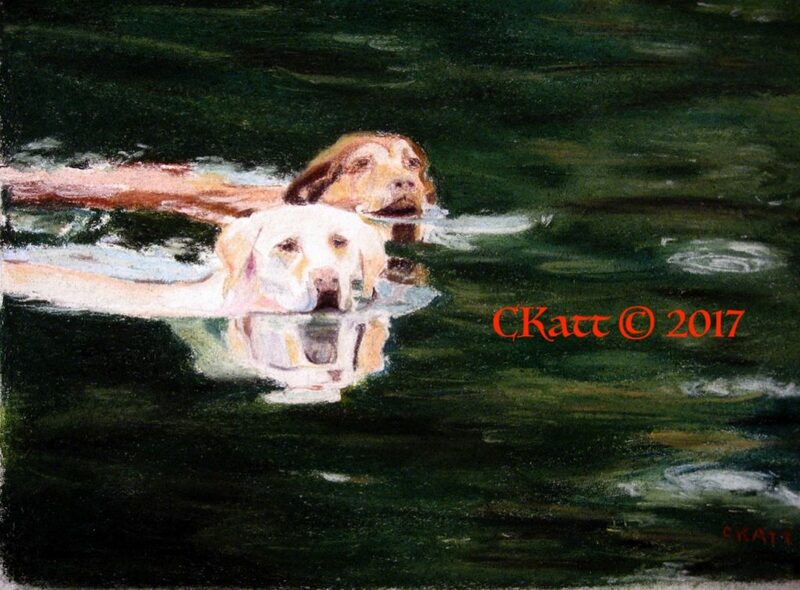 I was pleased to do this portrait and enjoyed the challenge of the swimming Labradors. It is a pastel drawing using both pastel chalk and pencil. It was a welcomed surprise for the birthday as both dogs had passed away. This was the first time I had seen Borzois at a lure coursing event in November. This beautiful Borzoi was so impressive. 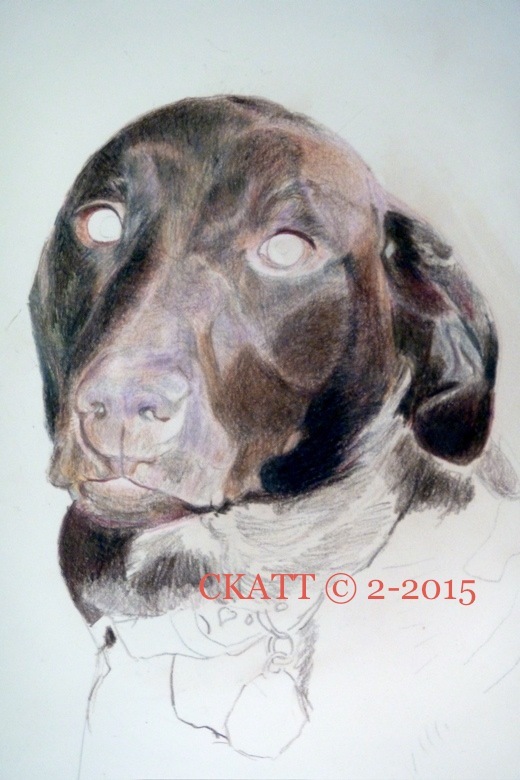 The colored pencil made drawing the details of the dogs coat a pleasure. I like the starkness of the landscape which frames his snowy coat. 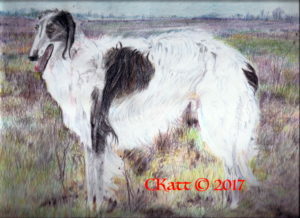 Borzois are sighthounds, who are attracted by animal movements. They are quiet and swift in the field. Lure coursing uses a mechanical, plastic lure. The lure travels through the field and the dog flies after it. This is a great activity to test the Borzoi’s hunting ability. 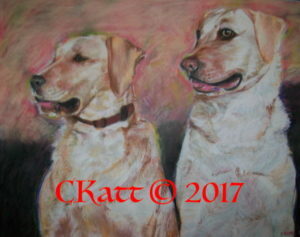 I enjoyed making this pastel portrait of these two healthy and happy Labrador retrievers. They were young and wiggly! Their owners had a time keeping them quiet for the photoshoot, but they were very sweet. 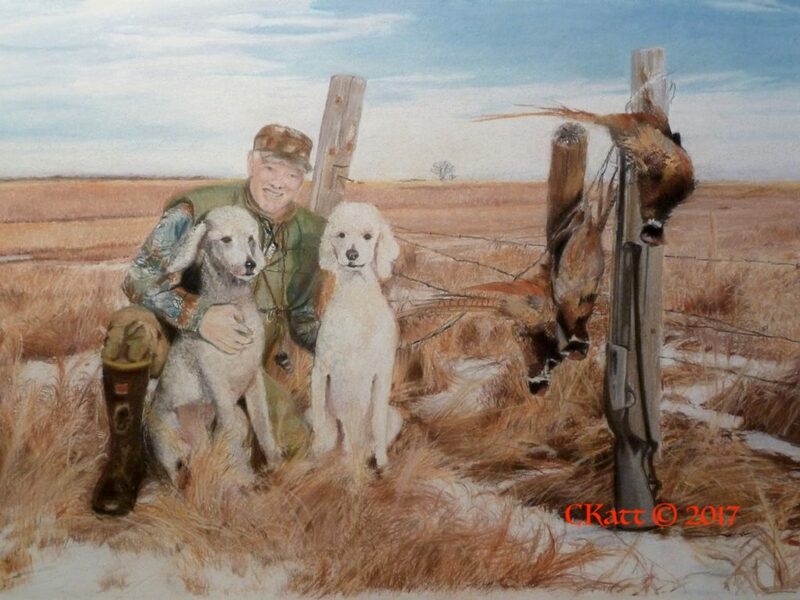 The portrait made the owners very happy. Labrador Retrievers are very popular dogs in the Upper Midwest of the USA. 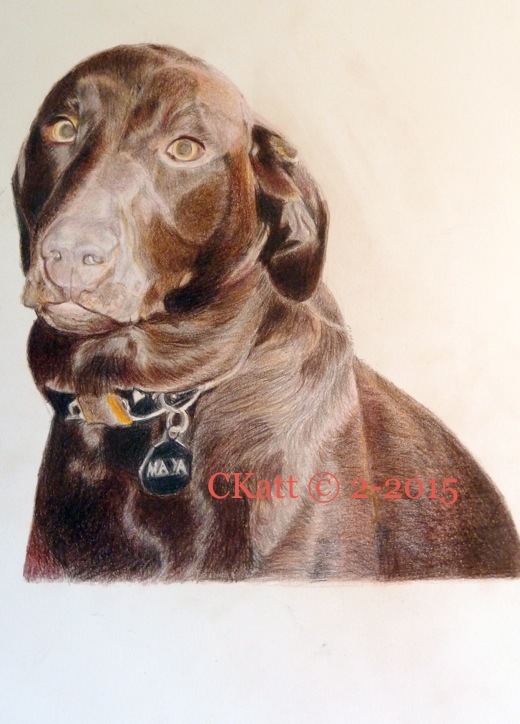 It took a week to finish the colored pencil portrait of Maya pictured here. It is a small piece 8″ by 10″ on Bristol paper. This is a smooth surfaced paper which works well with layering the colors. 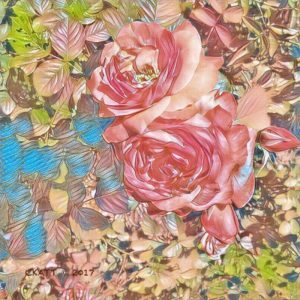 Most of the time, I use paint or pastels to create my own pieces. Using the colored pencils is a fun exercise in the use of color. Someone stopped by my blog and commented on the drawing of Maya. There was surprise for me when I visited this person’s blog. There was a long post about taking drawing classes. 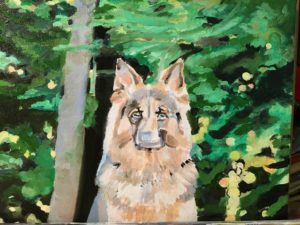 It turned out this writer wanted to draw and paint, but suffered from terrible anxiety when it came time to start a painting class. There were many kind responses to this post. People shared many perspectives. 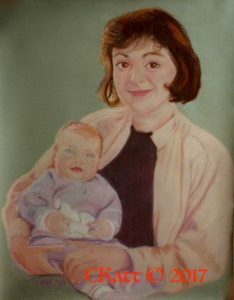 I studied painting, drawing, photography, lithography, etching and learned countless crafts to teach in school settings. With each phase, there was what I called the first day of the lesson. All the unknowns would be revealed – the teacher, the students, the lessons. I wanted to learn. In my first figure drawing class in college, my professor told me that I drew “like a barbarian”. As I looked at the drawing he was looking at I realized he was correct. It took two years of drawing, for four days a week, to learn to draw with expressive lines that I could control. After studying to be an art teacher and watching students evolve in art classes, I came to believe two very important things: First that anyone who wants to can learn to make art. Second all it takes is the desire and discipline to learn with an open beginner’s mind. That means (to me) Be there to try things out and don’t be afraid to fail. Every learning in life takes practice. When I learned how to make lithographic prints, I had one of the top lithographers in the country as a teacher. He was very strict. You cannot fudge a process like lithography, which takes many steps before you have a completed print. In the beginning of my two years of practicing this technique, I made every mistake in the book. It was a slow process of learning, that taught me the value of learning from my mistakes. The perspective I gained gave me a sense of humor about being human and not giving up. This attitude has kept me going with my cooking experiments, at my blog Kunstkitchen and anything new that’s worth learning. I tell myself , “Just show up and see what comes to you.” That’s life. Keep on keeping on…woof woof! This is a small portrait, which was great fun to make. 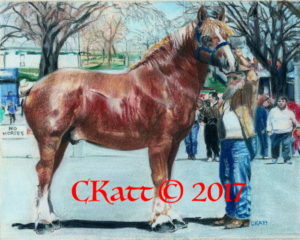 The tones in the horse had me buying every brown to beige pastel pencil I could find, at the time. The title is “Proud Owner” whose name is Butch. It caught the weight of the horse and the beauty of the Belgian Breed. I like to include the crowd scenes sometimes in my work to add the excitement of the event! Horses are fascinating subjects to draw. While I work from a photograph, my aim is to go beyond the flat image and share the depth of the space and time of the portrait. Thankfully Draft Horse breeders are still active in perfecting the “great horse” for size, temperament, and work. Otherwise these magnificent giants would be gone. The 2017 Minnesota State Fair Draft Horse competition for six horse draft and single horse cart draft was a sight to behold. Later on I will share some highlights.